Update your API keys for Read / Write capability, not just “Read”. We know many of you have been waiting for this release for a while, and we wanted to say that we’re sorry for the delay. We got pushed back a bit with the WooCommerce 2.2 release, as Max devoted some time to adding webhooks and REST API components to WooCommerce core, which will lay the groundwork for future features. We know that most everyone would obviously rather see new app features than development components they never interact with, but the sooner we had the full REST API in core, the easier it will be to continue making progress on the app. We also had to take care of some performance issues at scale with this release that may not have affected all of you. Now on to the cool stuff! This release had several small improvements that had to be implemented along with new features, so all of the new stuff may not be usability changes, but we’re okay with that. We’ll go through some features we’ve added, and the fixes we’ve made. Also, special thanks again to Jay Koster over at WooCommerce, who is our design liaison and contributes a lot to the user experience of the app. First: You can update order statuses! Rejoice! We know this was the biggest feature that was requested, and this is why your API keys need write access. 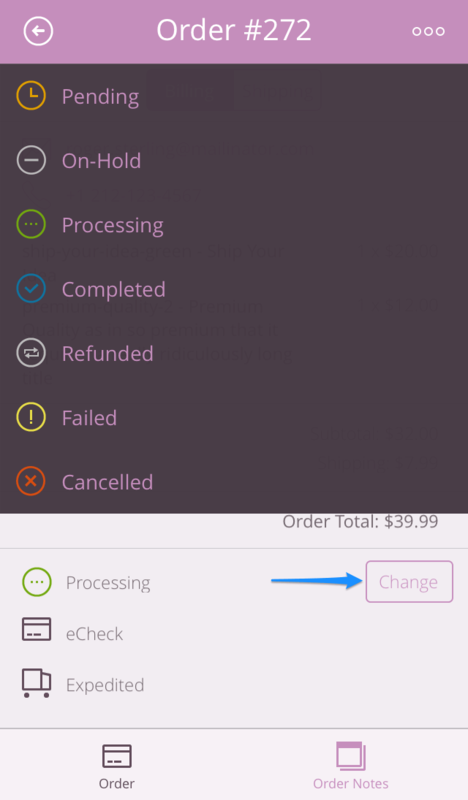 You can now change an order status by viewing the order and clicking “Change”. 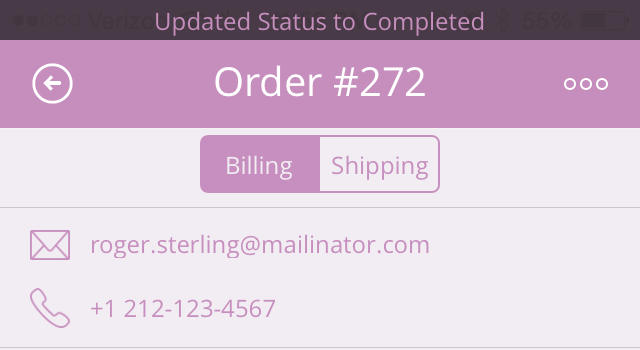 This will let you select any core WooCommerce order status to update to from a dropdown. It’s not yet possible to display your custom statuses here, but we’re working on this with API improvements that will allow us to do so in a future version. Once you’ve selected your status, you’ll then see it updated as the app communicates with your website. You won’t be able to do this unless your API keys have write access, so if you see an error, chances are this is the culprit. 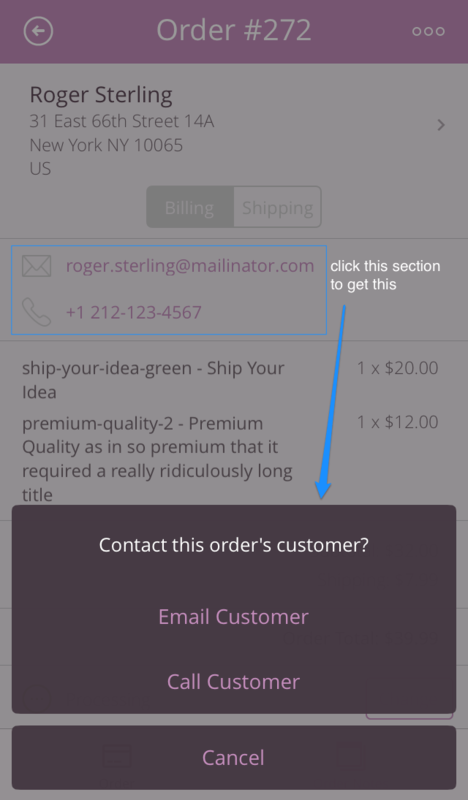 We’ve also added better order management tools. We now have an order management menu that you can access from the top right of the order screen. 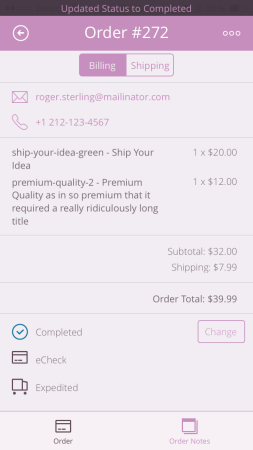 This will let you copy billing and shipping details, as well as contact the customer. You can now contact the customer by clicking the middle section, which includes contact details. These are also now formatted correctly, as we didn’t always format international phone numbers the right way. 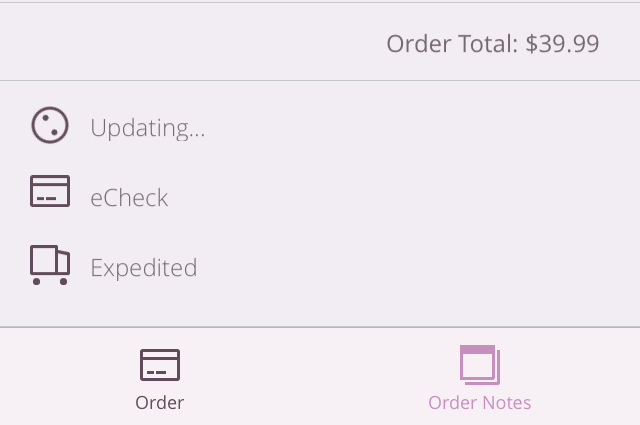 We’ve improved the order details display as well. Version 1 of the REST API, which the app uses, does not allow us to display variation data (which was an oversight!). 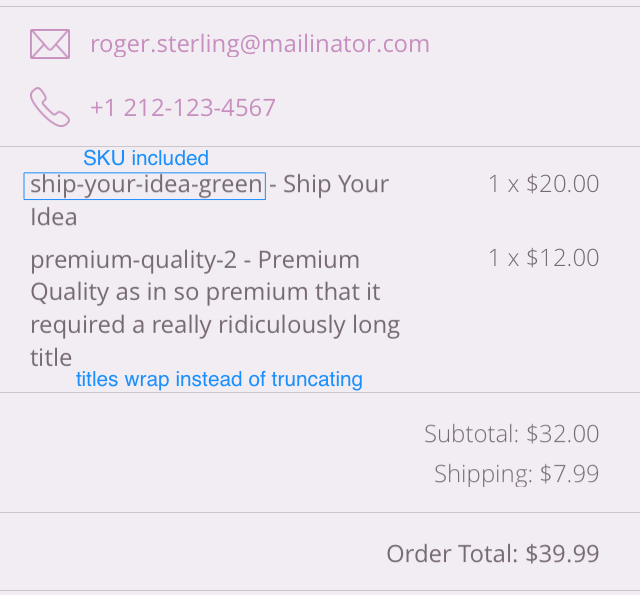 To work around this, we’ve added the SKU into the order details, which you can use to distinguish your products. Once we migrate this section to REST API version 2 we’ll be able to include this data. We’ve also included full product names in this section, as we’d previously truncated them. Product names will now wrap around to the next line so you can see the entire title. As a final feature, dashboard data is now refreshed in the background so that you don’t have to constantly manually pull to refresh. 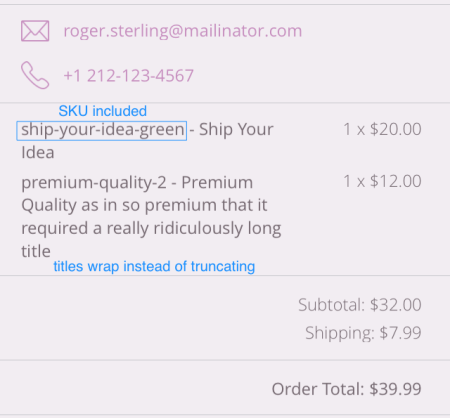 If your product have custom weight or dimension units, they’ll now be displayed. We’ve improved caching handling, as this was causing issues with orders not being updated. 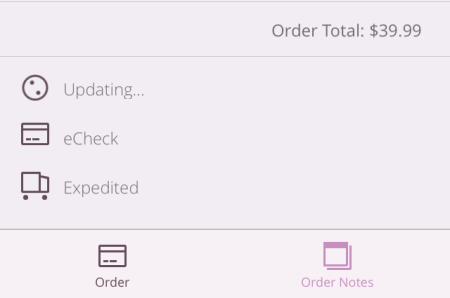 We’ve worked around this even if you cache ALL THE THINGS so that you’ll see the most recent order information. The app also didn’t handle shops with lots of products well. When hundreds or thousands of products were added, the app was buggy and slow because we tried to fetch them all at once. Now we’ve improved this to batch how we fetch products. We saw an issue where products without a thumbnail tried to steal it from others when displayed in the app in our previous version. We’ve slapped these products on the back of the hand and told them to keep their figurative hands to themselves. No more thumbnail theft. Finally, we’ve improved iOS 8 compatibility with this release. 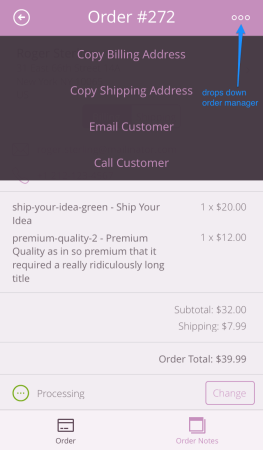 We did plan to implement order push notifications in this WooCommerce iOS release, but they were actually what was holding up the entire version. We ran into some technical complexity in implementing them, as they would have impacted battery life a bit for users with one store in the app, and could have severely impacted performance for users with multiple stores. We were also concerned about performance, as the app is running on your website’s server, which means that we have to be extra-careful about compatibility. There are tons of environments we have to account for with this feature. As a result, we scrapped our entire approach to get this version out without them, and we’ve already begun redoing push notifications. We’ve made this our major feature for version 1.2 instead. Rest assured that we’re already working on it, not starting it, and we have an approach that we’re far more comfortable with that we know will result in better performance. 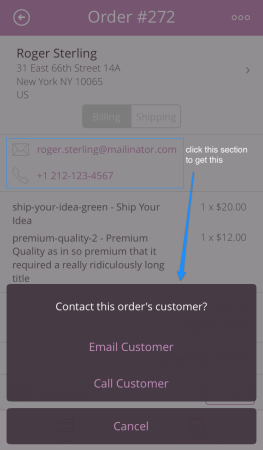 Please be aware that push notifications will require WooCommerce 2.2, so please consider upgrading if you haven’t! As mentioned above, push notifications will be the focus of the next version. We’re also planning to improve the dashboard reporting options. We know many of you would like to see data for longer than one month, so we know we’ll be adding more to this, but we’re not sure what it looks like yet. Adding a report for “This Year” is probably most feasible, but we’d like to explore how difficult a UI for a custom range would be. We’d love to hear what you’d like to see for this! Finally, we’re aware that updating inventory is a big desire, so we’re planning this to round out the feature list for version 1.2 as well. 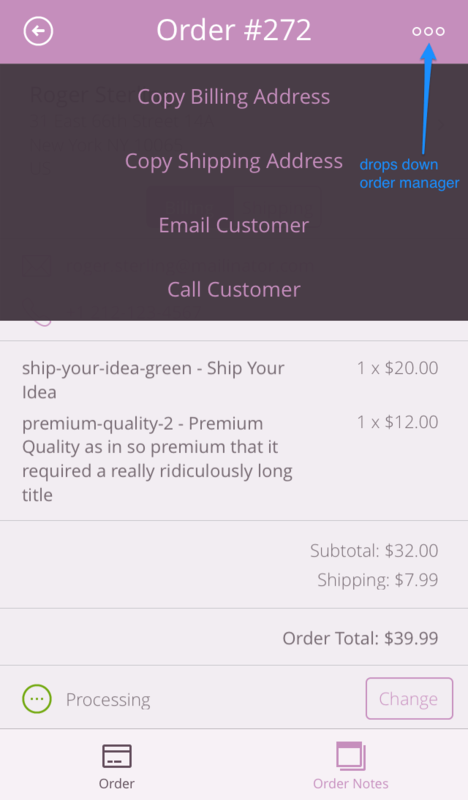 This will also require WooCommerce 2.2 in order to be used in the app. You can keep making them happy if you let us know what else you’d like to see in the comments, or leave us another review for this version! Thanks all! I know this has been asked repeatedly, but I figured I’d comment here (and get a response) for others to see. Any word on an Android app? Hey Rob, would be happy to take a look. Could you drop us a quick line here with your credentials? https://support.woocommerce.com/hc/en-us/requests/new?ticket_form_id=60703 Some hosts have been disabling PUT requests so we’d need to check it out 🙂 . Thanks! 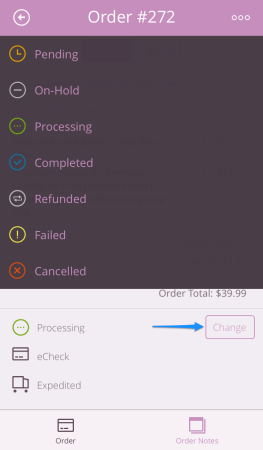 Hey can you submit a support ticket at WooCommerce.com? We can help get this sorted out. Yes ROB, I have the same issue and I can not find a solution. Did you solved it ? Very interested in this! Can I purchase the app to gift to others? I think it would make a great little Christmas gift for my clients. My Store country is set to Switzerland but the phone number starts with +1 which is the US country code. Could you please fix this. Thanks a lot. Hey there, thanks for pointing this out! We have seen this with a few countries and we’re submitting a patch to Apple for review this week. Sorry for the inconvenience! PRINTING!!!!!! I would love to be able to print the invoice/dispatch note directly from the app to my airprint printer. Any chance? 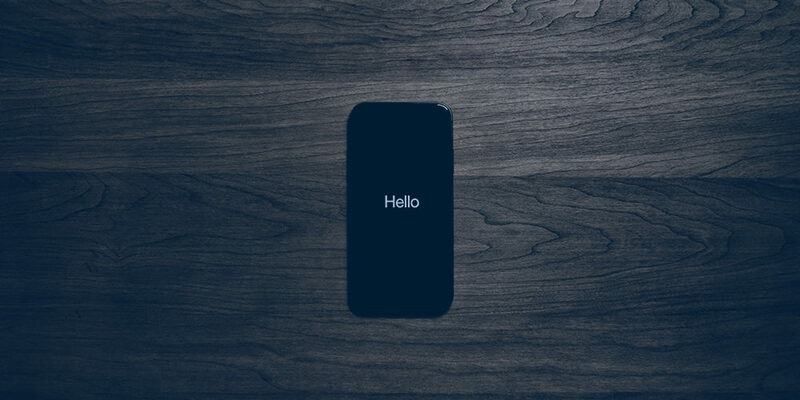 Is the ios app going to be open source? Hi there, we don’t have plans to open source the app at this time. Hey all, version 1.1.1 is out – details here. We do already have version 1.1.2 almost done and ready to submit. If you’re one of the people who’s having trouble with write permissions (updating order statuses), chances are this will be fixed with v1.1.2 that we’re about to submit to Apple. It creates a workaround for incompatibilities with some server environments that aren’t allowing you to post information to your site.